Hockey Plumber: July 4: Who Still Remains Independent? Entering the fourth day of free agency, many impact players still remain on the market. Let us examine some of those players and discuss where they may end up. Alex Tanguay, LW - Avs, Thrashers, Devils: Avs freed up space in the Smyth deal today. Thrashers need 1 more skilled forward, Devils replace Gionta? Alex Kovalev, RW - Caps, Sabres, Islanders: Caps replace Fedorov, Sabres and Isles add a skilled, veteran point producer. Saku Koivu, C - Wild, Ducks, Rangers: Wild have his brother, Ducks his buddy Selanne and Rangers need players signed. Petr Sykora, RW - Pens, Devils: the two teams who see value in Sykora's game, or the KHL beckons. Ales Kotalik, RW - Oilers, Devils, Rangers: Oilers keep a speedy asset, Devils and Rangers see above. Maxim Afinogenov, RW - Caps replace Kozlov? Francois Beauchemin, D - Leafs, Habs, Pens: Leafs keep adding hard-nosed players, Habs replace Komisarek, Pens Scuderi? Sergei Zubov, D - Blues, Rangers, Ducks, Canucks: Zubov getting up in years but all there teams still see a speedy, puck moving blueliner. Dennis Seidenberg, D - Canes, Jackets, Rangers: Somewhat underrated balanced d-man. All of these teams fit nicely. Jay McKee, D - Pens, Preds, Hawks: Stay at home, hitter type. Manny Fernandez, G - Leafs, Stars, Sharks: Whatever teams lose out on the "Monster" sweepstakes will look at the best netminder available. Phil Kessel, RW: The Bruins just don't have the cap space to keep him. Trade still most likely possibility. Jack Johnson, D: The Kings just dealt away a high priced blueliner, Tom Preissing, in the Smyth deal... to free up space to retain JJ? Johnson has been rumored in trades all off-season, particularly Pittsburgh to play with his BFF Sid, but I cannot see this working out. On a related note, Mirtle put together a fantastic chart on all 30 teams and their remaining cap space. It is particularly interesting because he considers each teams' projected budget, not just the cap max. The Colorado Avalanche have traded forward Ryan Smyth to the Los Angeles Kings for defensemen Kyle Quincey, Tom Preissing and a fifth-round pick. 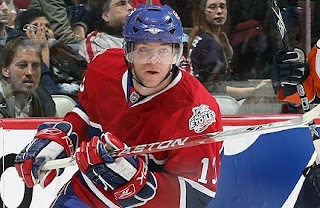 The Pittsburgh Penguins and Ruslan Fedotenko signed a one-year, $1.8 million contract. Ryane Clowe re-signed with the San Jose Sharks. ESPN reports that it's a four-year deal for just over $3.5 million a season. The Vancouver Canucks signed winger Mikael Samuelsson with a three-year, $7.5 million deal. Samuelsson in an interview later stated that the "money was key." - refreshing, huh? The Minnesota Wild signed defenseman Shane Hnidy to a one-year contract. Value not disclosed.